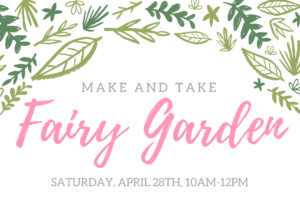 Create your own table-top succulent fairy garden with the help of guest artist Jennifer Vincent-Mills from Linden Floral. Each garden can be created by up to 3 participants. Advanced registration is required. Children must have a parent or guardian registered to participate. Registration deadline is April 26th, cancellations are required 7 days prior. $40 per project, supplies provided. Includes admission for two to Enchanted Forest. Admission for a third participant can be added.